For some people having an advanced notice is vital, while others actually enjoy more last minute plans. For people who prefer an advanced notice, having to do things last minute can be stressful. They also don’t like feeling the need to change anything when they’ve already worked it out one way. 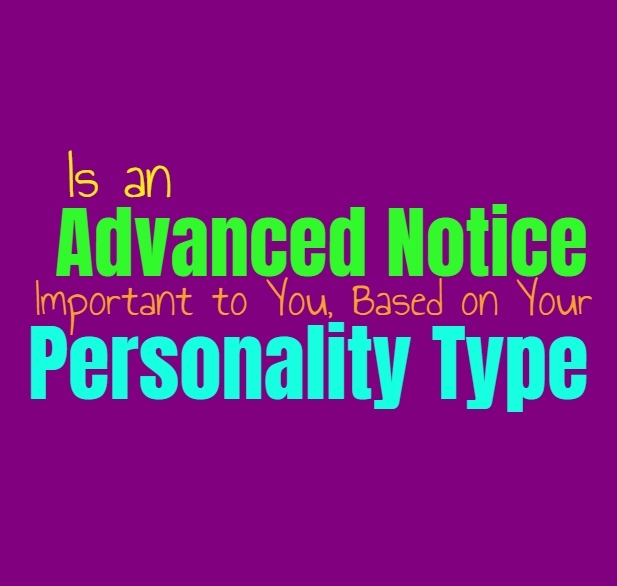 Here is how important an advanced notice is to you, based on your personality type. INFJs definitely feel happiest when they have some sort of advanced noticed. Having to do anything without knowing ahead of time can be stressful for them. They need to be able to prepare themselves for what is to come, and don’t want to walk into things blindly. For INFJs advanced noticed with most things makes them happy and gives them a sense of comfort. When something is sprung on them last minute it can cause them to feel like they have to scramble to make the right choices and adjustments. For then having last minute notice for anything, especially work related details, is very frustrating. ENFJs are happiest when they don’t have to worry about doing things last minute. Having an advanced notice is really important for them, since it helps them prepare. While some people may not understand this side of the ENFJ, it comes from wanting to get things right. They are perfectionists and don’t like feeling like they have failed their loved ones in any way. For the ENFJ an advanced notice helps them mentally prepare for what is to come, and often organize others things and move their schedule around. Having someone change dates or situations without a reasonable notice, is stressful for them. INFPs don’t really need advanced notice for most things, expect for social gatherings. People often view them as spontaneous and while that is true most of the time, they feel differently when it comes to socializing. INFPs become drained with too much interaction, and so they often need to prepare themselves before stepping into overly social situations. While they enjoy being around friends, it simply becomes tiring after a while and the INFP needs an escape plan. For them an advanced notice simply helps them get prepared, and sometimes helps them come up with an excuse to cancel. ENFPs don’t really need advanced notice for most things, since they prefer to be a bit more spontaneous. They don’t need everything to be done in the moment and some planning is fine, but they can have a hard time executing it themselves. For the ENFP the biggest issue with advanced notice, is remembering the plans they have made or the schedule they are supposed to keep track of. They do become easily distracted and find themselves pulled in different directions without meaning to be. INTJs definitely appreciate an advanced notice with most things in life, since they prefer to be prepared. They don’t like when things are sprung on them last minute, since this causes them to have to adjust to things in a way that can be frustrating. INTJs do whatever they can to avoid making mistakes or doing anything which feels like a failure. For them this means an advanced notice is always appreciated since it gives them time to mental prepare for the situation. When people change things without giving them time to really adjust, it can be rather annoying for the INTJ. This doesn’t mean they will fail to adapt, it just causes them serious irritation and a bit of anxiety. ENTJs definitely want advanced notice with things, or else they become stressed and scramble to focus on adjusting to the circumstances. ENTJs won’t simply give up or gripe when they are made to change things without an advanced notice, but they will become extremely annoyed. They also become stressed when this occurs, since they don’t have the time they need to prepare for the situation and adapt to whatever might happen down the road. ENTJs are perfectionists who believe in working hard to get everything done efficiently the first time around. INTPs don’t really need advanced notice with most things, and enjoy a bit of a challenge. When something is sprung on them last minute they will do their best to adapt and figure out how to navigate these changes. In some circumstances it might cause the INTP to feel stagnant though, especially if they don’t want to adapt to these changes and dislike feeling like someone is rushing them. Most of the time last minute plans don’t bother the INTP that much, since they are spontaneous people. ENTPs don’t mind when they aren’t given an advanced notice, especially with things that challenge them a bit. What ENTPs really despise is constantly having things planned out and scheduled down to the tiniest of details. If something changes without an advanced notice it gives them a chance to adapt and really challenge themselves to figure things out. ENTPs dislike boredom and would rather have things shaken up a bit, than to be stagnant and feel like their entire lives are planned. ISTJs definitely value and advanced notice and dislike when anything is sprung on them last minute. They want to be able to prepare for things, and enjoy having time to research just about any task they are required to do. For the ISTJ advanced notice helps them get into the right mindset and get ready for anything which might go wrong. This helps the ISTJ become more efficient, and without this advanced notice they are under much more stress to accomplish their goals accordingly. ESTJs don’t like when things are sprung on them last minute and so for them an advanced notice is truly vital. They want notice when it comes to just about everything, from work changes to social interactions. They often want to be able to plan for most situations, and especially feel this way with important tasks. ESTJs value efficiency and without having some time to prepare it can be challenging to be perfectly efficient with new things. ISFJs definitely want an advanced notice with just about everything they do. They even enjoy having some sort of notice when it comes to social plans, since this gives them a chance to prepare. They want to be able to make time for people, and without having this notice they can become stressed about other errands or chores which need to be done. For the ISFJ doing things last minute just creates a lot of unnecessary stress in their lives, and so having advanced notice means a lot to them. ESFJs definitely require advanced notice with most things and can become rather stressed without it. They want to be able to prepare for things, often because they are perfectionists. For the ESFJ it can be stressful to feel like they aren’t going to get something done to their standards, and without having time to prepare they feel like this might happen. For the ESFJ advanced notice helps them adjust and adapt to the situation, without feeling as much anxiety as they would without it. ISTPs don’t really need advanced notice for most things and actually enjoy living in the moment. Having people constantly try and plan things out for them is really more stressful than anything else. ISTPs enjoy living in the present and sometimes being spontaneous and having to deal with last minute changes is surprisingly enjoyable. They don’t want their lives to become stagnant or boring and really need to have things shalen up from time to time. ESTPs don’t need an advanced notice for most things, sometimes they enjoy being able to mix things up. When changes happen last minute it isn’t always a bad thing, especially if it comes from someone close to them wanting to do something fun. When the ESTP has last minute work changes they do their best to adapt to this situation without letting themselves become too stressed about it. For them it is nice to have a bit of change and thrill in their lives, since stagnancy and being overly planned is actually more stressful. ISFPs don’t mind when things happen without advanced notice, and often they prefer this. They are spontaneous and free-spirited people who enjoy being able to live in the present moment. When someone they love springs last minute plans on them it can actually be very exciting and thrilling for the ISFP. Having to live with everything planned out ahead of time is both boring and frustrating for the ISFP. While ESFPs don’t mind an advanced notice with some things, they often prefer to enjoy last minute plans. For them it is worse when life becomes stagnant and boring, and would not have to live by a constant schedule. Having every detail planned out ahead of time is more stressful for the ESFP than anything else, and leaves them feeling constantly controlled by others. ESFPs are spontaneous people who enjoy having things shaken up from time to time.